The bane of every parent or caregiver is the temper tantrum! Temper tantrums are a normal part of every child’s behavior during the terrible two’s and trying three’s! So, how do we handle them when they occur? Let students build an arsenal of techniques as they explore what’s appropriate and inappropriate in the lesson and activity below. Show students this temper tantrum clip (or another if you have one you like better) and have them complete the ticket to class of their bell ringer. Discuss their reactions and responses to the tantrum they just viewed. 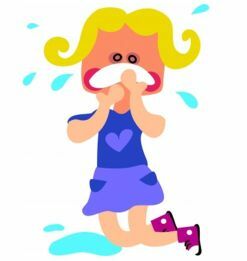 Give a brief overview of temper tantrums explaining the typical causes such as frustration, lack of routine resulting in over-tiredness, hunger and boredom and the fact that toddlers are trying to gain independence. So, how do we handle temper tantrums when they occur? Explain to students that there are appropriate and inappropriate ways to do this. Each student will receive an index card and a topic to explore. Cut up the technique card topics and place them in a bag. Students will randomly select a technique to learn more about. Students must find out if their technique is an appropriate or inappropriate way to deal with a temper tantrum and why. Students must use and cite at least 3 different reputable websites to find the answer. The index card is set up with the technique as the title and then a solid paragraph minimum of explanation as to whether or not the technique is appropriate and why. On the back of the card students will cite their sources. After students have completed their research, they orally present their findings. We create a master list of appropriate and inappropriate techniques on the board which students write down on the back of their bell ringer. 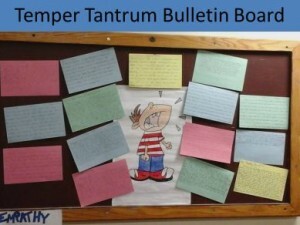 The exit activity is to watch the original temper tantrum clip again answering the prompt, referring to their charts as they view and write. Bulletin Board: I had an artistic student draw a child throwing a temper tantrum and hung it on my bulletin board surrounded by students’ index cards, with one side for the appropriate techniques and the other for the inappropriate techniques.